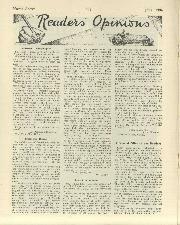 "He can be regarded as the leader of the latest type of racing-motorist created in the atmosphere of the track" - The Autocar writing about Percy Lambery in 1913. 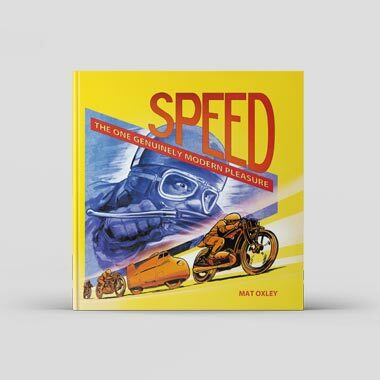 "Because road-racing is so entirely different from track-racing in any of its forms it is rare to find that anyone whose whole enthusiasm is centred about the very fast run of the Track can take quite the same interest in other branches of the sport." 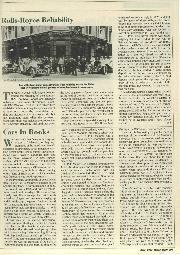 - S. C. H. Davis writing about John Cobb in 1953. There is a subtle difference between being a racing-driver and a racing-motorist, a division of purpose more pronounced, of course, before the war. 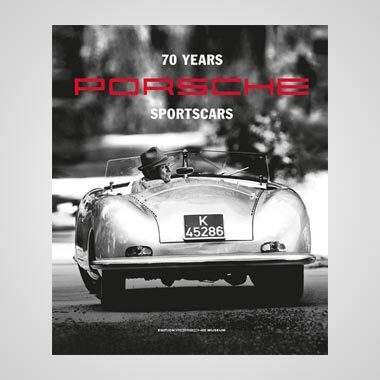 If I had had the opportunity to indulge in the finest of all sports when I was young, in the days of Brooklands and Donington, Lewes and Shelsley Walsh, I would have been a racing-motorist, not a racing-driver. What I mean is that I would have been so keen on racing cars and everything to do with them that I would have been brave enough to trundle something round the Brooklands outer-circuit. But I doubt whether I would have had the guts, or have developed the skill required, to become a good (or even a mediocre) road-racing driver. The distinction I am trying to draw is a subtle one but is recognisable, especially in those now-far-away pre-war days. There were many competitors who loved "messing about with cars" but who never aspired to serious motor-racing. It was more a matter of ability, even inclination, than money and opportunity, in many instances. Naturally, there were great numbers of drivers, particularly at Brooklands, who seldom appeared anywhere else. To list all these "racing-motorists" would be trite they included so many amateurs, not to mention several ladies of the kind who otherwise would have been found tweed-skirted on the golf-course or following some similar kind of male-oriented occupation, for reasons it is kinder not to explore. 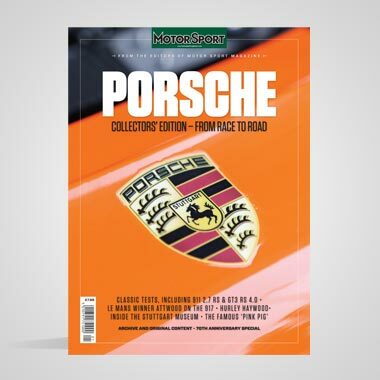 But in the upper echelons of motor-racing it was, perhaps still is, possible, I believe, to divide the successful and famous participants into my two categories racing-motorist/racing-driver. This is far from suggesting that in doing this we are separating the boys from the men. Because while speeds of 90 m.p.h. or so at Brooklands called for no great skill or courage, as I can testify, to lap the old Track at over 120 mph. was different, and to go round it at upwards of 130 m.p.h., which only 17 did, just as brave and accomplished, in my opinion, as taking a high place in important road-races, although the latter usually lasted longer. It is just that some drivers excelled at one kind of racing, others at the other, and it may be amusing to look a little more closely into this. In so doing, the difficulties soon arise, in that many famous drivers of the era I am mainly concerned with excelled in both fields. For instance, Capt. George Eyston was noted for his almost endless, very effective record-breaking exploits, which took place mainly at Brooklands and Montlhery and thus put him into the "racing-motorist" category. As, I suppose, do his later Land Speed Record successes, in a frighteningly large and very fast car. 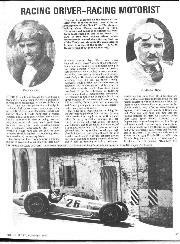 But George had some notable road-racing achievements as well, for example with his Bugatti at Boulogne, and with Lea-Francis, Alfa Romeo and Maserati cars in the Ulster TT, etc. He drove a Monza Alfa Romeo in the 1933 French GP, an MG in the Mannin Beg, etc., and won a "road-race" at Brooklands in the famous "Humbug" MG Magnetic, using the correct body for this car for the occasion, and there was his victory in the 1,100 c.c. class of the 1933 Mille Miglia for MG, etc. So G. E. T. Eyston, apart from being one of motor-racing's gentlemen, was notably adept at both forms of the game. Do you think, though, that his great record-breaking career makes him slightly more of a racing-motorist than a racing-driver? Not, as I have said, that, either way, this in any way belittles his prowess when he took the coveted World's Hour Record with the big 8-litre sleeve-valve Panhard-Levassor single-seater he had to train hard beforehand, for what was both a dangerous and an exhausting task. In making these comparisons, however, remember that we are weighing the pre-war racing-motorists against such racing-drivers as Nuvolari, Campari, Varzi, Caracciola, Rosemeyer, Chiron and Seaman, to name but a very few. 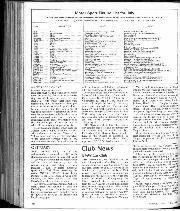 How does Sir Henry Birkin, Bt., rate, in this connection? He was well known for his lap-record drives at Brooklands with the blower- 4½ single-seater Bentley, but his love of road-racing and the amount of it that he did, with Bentley, Maserati and Alfa Romeo cars, etc., surely puts Sir Henry into the racing-driver category? 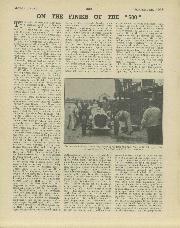 Then there is Sir Malcolm Campbell, who raced his Bugattis and other cars in road events but was also a noted outer-circuit track driver for so many years, going back to before WW1, and in later years the most devoted of all LSR exponents. How, then, shall we classify Campbell? Going back to an earlier era, Count Louis Zborowski might at first sight be termed justifiably a racing-motorist, with his regular Brooklands appearances in many different cars, up to the legendary "Chitty-Bang-Bangs". Yet his heart was in road-racing, which he did with Miller and Aston Martin cars, and he died at Lesmo corner in a Mercedes during the 1924 Italian GP. So was he a racing-driver? Earl Howe I rate in his own right as a talented racing-driver, but what of H. W. Cook, good performer on the outer-circuit yet able, comparatively late in life, to cope with an ERA on road circuits? Brian Lewis was a leading amateur racing-driver, but where do we put competitors such as Charles Brackenbury, Kaye Don, W. B. Scott, T. A. S. O. Mathieson, Kay Petre (God bless her), and Richard Shuttleworth? Just taking part in road-racing does not make you necessarily a racing-driver. 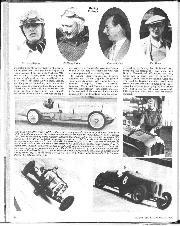 What of the "Bentley Boys", remembering that Jack Dunfee rated fast lappery at Brooklands in a long race a harder undertaking than doing well in a vintage Bentley at Le Mans? What of Elsie Wisdom, great lady exponent with the Leyland-Thomas and other very quick cars at Brooklands, yet able to win, with Joan Richmond, a Brooklands "road"-race in a small Riley? 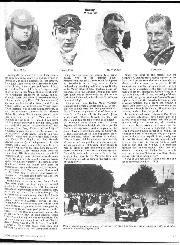 George and Jack Duller, Major "Goldie" Gardner and Ernest Eldridge and E. L. Bouts, I consider to have been fine racing-motorists and Parry Thomas the greatest of all of these but even Parry Thomas built his "flat-iron" 1½-litre straight-eight Thomas Specials for the road contests and ran his big Leyland at Boulogne ... Of Raymond Mays Prince Bira, Sir Henry Segrave and Whitney Straight there is no possible doubt racing-drivers. And so it goes on, this game I have invented! Even dear old Sammy (S. C. H.) Davis perhaps isn't a racing-driver, for he never competed behind the wheel in a Grand Prix, or do you think his many sports-car races in all manner of cars put him into this category? Which reminds one of Stirling Moss' ability to race all kinds of cars and Fangio's dislike of sports-car racing. Drivers such as Rosemeyer and Caracciola were able to cope with very fast, straight line records for Mercedes-Benz and Auto-Union, as well as being in the highest class of racing-driver. When you come to the present, can we continue it? Banked-track racing happens in the USA, but I am not sure whether the boys who lap these circuits at over 200 m.p.h. in USAC contests can be called racing-motorists - except that it is not a question of the degree of courage that decides the distinction. 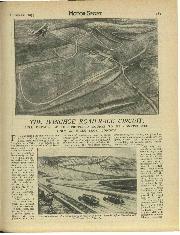 Cobb driving in a 500-Mile Race, with all that overtaking of slower cars to do, in a giant car almost devoid of brakes, right at the top of the Brooklands bankings, was a racing-motorist, but a brave one without a doubt. And those USAC drivers were able to set recent new Brands Hatch and Silverstone lap-records, so where does that put them? In modern road racing, where, as Paul Frere has pointed out, drivers have a mere 0.05 of a second or so in which to assess their safe cut-off under braking into the corners, with one-time 100 m.p.h. bends taken at well over 140, the former 120-m.p.h. curve at 190, and even the once-harmless 75 m.p.h. corner at 105 m.p.h., the courage and skill of the present-day participants is not in doubt - but equally brave, surely, was K. Lee Guinness, who had the unpredictable tyres of the 1920s to contend with, a burst putting him and the 350-h.p. Viz Sunbeam through the Railway-straight fence. So let's discount courage, or foolhardiness, in this assessment. So was Guinness, was Dario Resta, racing-motorist or racing-driver? Some of you may care to think about this and let us have your own lists. - W. B. ON THE FINISH OF THE "500"